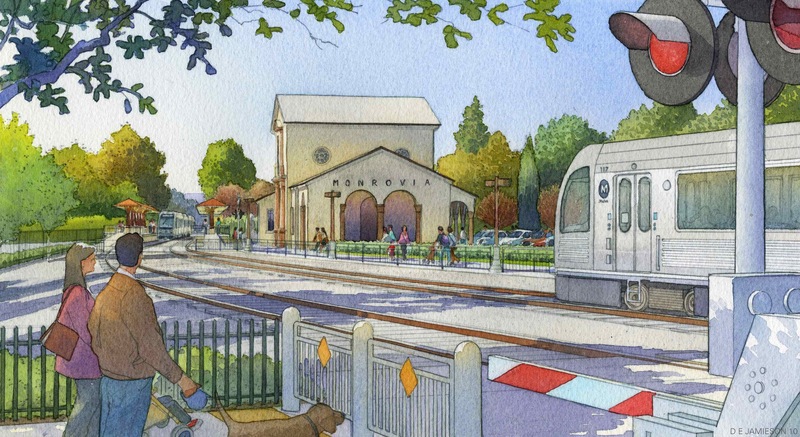 An artist rendering of the rebuilt Monrovia station that would serve the Foothill Extension of the Gold Line. As I posted yesterday, the Gold Line Foothill Extension project awarded its first construction contract on Friday. A ceremonial groundbreaking will take place in Arcadia on Saturday and work on a rail bridge over the eastbound lanes of the 210 freeway is expected to start within a few months. While the Foothill Extension has been a closely watched project in the San Gabriel Valley for many years, it’s lesser known around sprawling Los Angeles County. So here’s a little Q&A to explain some of the basics. Q: Why the big hoo-ha over the groundbreaking ceremony? A: The project has long enjoyed widespread support in the San Gabriel Valley but couldn’t be built until funding was secured — which came in the form of the Measure R sales tax increase approved by L.A. County voters in 2008. 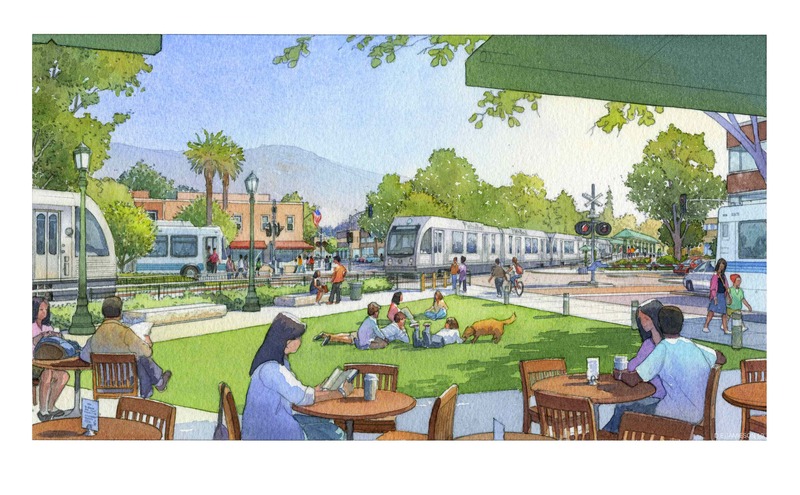 The Foothill Extension will be the first of the rail projects funded by Measure R to break ground and officials with the Gold Line Foothill Extension Construction Authority — the independent agency building the line — are projecting a 2014 opening. Metro will operate the line once it’s up and running. This greatly pleases public officials for a very good reason: they are anxious to show the public that they’re serious about building the projects promised under Measure R.
Q: Who will the Foothill Extension serve? A: The Foothill Extension will add 11.3 miles to the almost 20-mile Gold Line that runs between East Los Angeles, downtown Los Angeles and Pasadena. There will be stations in Arcadia, Monrovia, Irwindale and Duarte and two stops in Azusa — one in the city’s downtown area and the other by Citrus College near the Azusa/Glendora border. The Arcadia station at First Street and Santa Clara Avenue. Travel time between the future terminus in Azusa and Union Station is estimated at roughly 48 minutes. If you can consistently drive between Azusa and downtown L.A. in 48 minutes at rush hour — it’s at least a 25.5 mile drive, depending on the route — we’d love to know your secret. This should help those in the Foothill communities who want to take transit to Pasadena or downtown Los Angeles. For these Foothill communities, it’s a long, time-munching drive or bus ride to Metrolink stations to the south and/or Gold Line stations in Pasadena. And, while the current Gold Line has six stations in Pasadena, three of the final four stops — in other words, the easternmost stations — do not have parking. The current terminus at Sierra Madre Villa does have a parking garage that can hold 950 vehicles, although the garage sometimes fills very early in the day. The six new stations on the Foothill Extension are expected to have at least 1,500 new parking spaces between them on opening day, according to Construction Authority offiicals and more would be added after the line opens. It should also be easier for Foothill residents to walk, bike or take the bus to the new stations instead of sitting on the clogged 210 freeway to reach a station in Pasadena. A 2007 study, which is being updated, also found that there are hundreds of acres of developable land near future Gold Line stations. Although plans are still taking shape, the cities along the line are planning on new residences or transit villages at the stops. In Monrovia, for example, a 55-acre mixed-use development that could include up to 3,500 residences has been approved and would be adjacent to the new Gold Line station. How much of that actually gets built will, not surprisingly, depend on how the economy performs in the coming months and years. 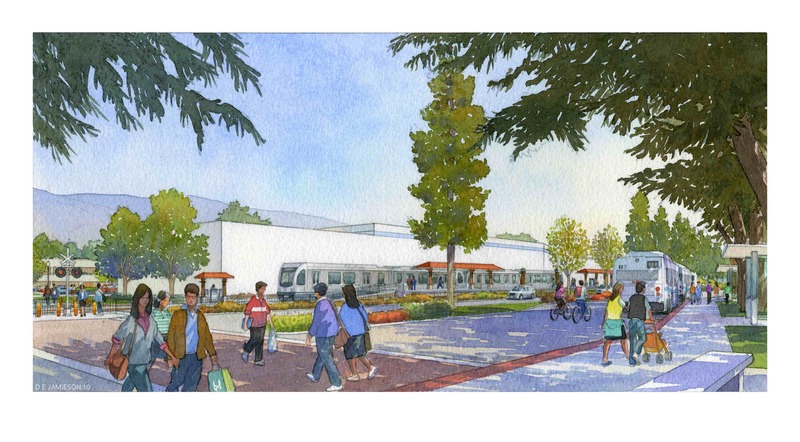 A rendering of the Duarte station, to be located along Duarte Road near Highland Avenue. Q: When will the second phase of the Foothill Extension that would run between Azusa and Montclair be built? A: It’s not yet known. The segment between Pasadena and Azusa will receive up to $810 million in Measure R funding, according to an agreement between Metro and the Construction Authority. But building the entire line to Montclair is expected to cost $1.2 billion, according to the Construction Authority, and there is no local funding source yet to complete the line. The Azusa-Claremont phase is, however, in the environmental study phase and is also in the Metro long-range plan for transportation projects. Metro is seeking federal ‘New Starts’ money for the Westside Subway Extension and Downtown Regional Connector and there remains the possibility that the second phase of the Foothill Extension could receive other types of federal money. As with all federal funds, getting the money likely won’t be easy — although it may help that the Foothill Extension enjoys widespread political support in the San Gabriel Valley. 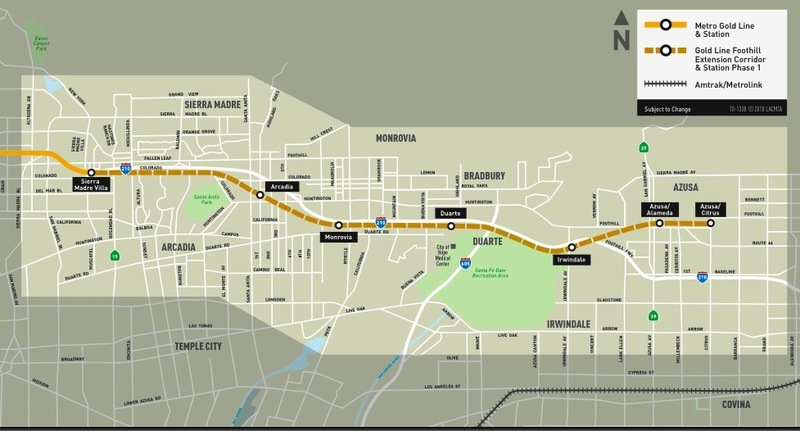 A possible third phase of the line from Montclair to the Ontario Airport is also under study and would extend the Gold Line’s sphere of influence into San Bernardino County. Q: Are there any hurdles that remain before construction of the main part of the Foothill Extension begins? A: Yes, there are two. The first is that the Construction Authority still must complete a deal with the freight railroad BNSF over using its right-of-way east of Arcadia. The Foothill Extension is being built along the freight right-of-way and BNSF needs to agree to surrender its right-of-way along one stretch of track and agree to share another. Negotiations are underway. The second deal involves Metro securing land in Monrovia to build a maintenance and storage facility for Gold Line rail cars. Officials say that both deals should be completed relatively soon — and that both are critical to getting the line built. Q: When will other Measure R rail projects get built? Of course, this could all change — and change for the better — if Congress and the federal government approve the 30/10 Initiative that as presently written would build 12 Measure R rail projects in the next decade. It is also worth noting that the Measure R funded four-mile Orange Line busway extension between the Canoga Station and the Chatsworth Metrolink Station is already under construction with a projected opening in 2012. Q: What does this have to do with the Foothill Extension? A: Because it means that an actual transit network is taking shape in Los Angeles County. If all goes well, in a decade a passenger boarding the Gold Line in Azusa can take that same train to within two blocks of Staples Center and L.A. Live. By the same token, that same passenger getting on the train in Azusa could continue to Long Beach or, with one transfer, board either the subway to Westwood or Expo Line to Santa Monica. Goodbye Santa Monica Freeway!